Angie Stern’s real name Is Claudia Hagmeyer. She was born in 1977 in Neu-Ulm, Germany. As a Child she already has won painting competitions and has visited the FOS High School For Design in Würzburg, Germany. At young age she also already wrote songs for guitar, children’s stories, stories and poems, with which she has taken part on small and big stages since 1998 as song writer and cabarat called “Gaudi Claudi” (beginning in Würzburg at “Poetry Slam”) . In 2002 Stefan Raab discovered her at German TV show “Morning Star” on Sat 1, where she played her song “Lieblingsstern – ich hab dich sehr sehr gern” on guitar. She was invited several times to Raab’s TV Show “TV Total” where she played this song four times and was able to win the award “Raab der Woche” for two times. Her Song “Lieblingsstern” was part of the 2002 released Stefan Raab CD called “HITS Total Volume 3”. She was also part of the 2009 released Stefan Raab DVD called “10 years TV-Total”. Stefan Raab was one of the most famous TV Entertainer in German Television. Afterwards she successfully finished commercial training with IHK certificate in Nürnberg. She also successfully attended the class of professor Angermann at the academy of arts in the winter of 2009 / 2010 – where she already had performed with her guitar some years ago. I am also looking for a publisher. In the beginning I painted very realistic, but since 9 years I discovered other own art styles like surrealistic, intuitive expressionism, made with acrylic, oil, pastel on paper, canvas and carton. My pictures are part of my soul, childlike naive forms, that enclose as original unique symbols after watching for a longer time. 2016 Joint Exhibition at “Art Basel” in Miami Florida USA in cooperation with swiss gallery “Artbox”. 2016 Dec. Exhibition at Schröders Book Cafeteria in Wildflecken Bad Kissingen Germany. From March 5, 18 until March 16, 2018 I have taken part in “Armory Artweeks” in New York, in cooperation with swiss galery Artbox. From October 31, 2018 until November 30, 2018 Exhibition at Express Cafeteria in Nuremberg, Germany. 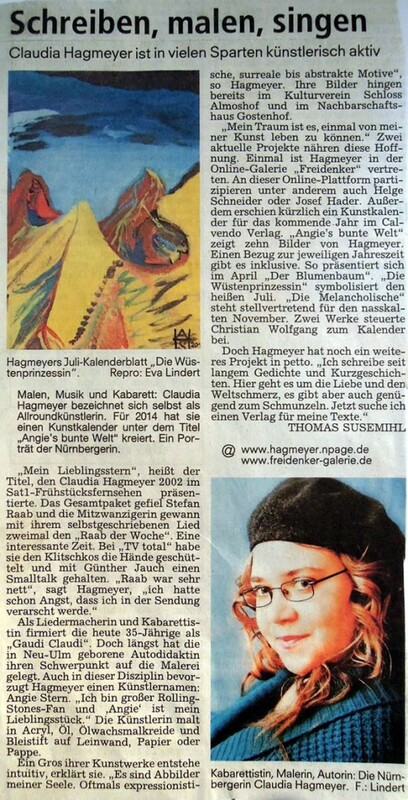 Painting, music, cabaret: Claudia Hagmeyer calls herself an allround artist. In 2014 she has created an art calendar called “Angie’s colorful world”. Here a brief summary about this Nuremberg artist. As a song writer and cabaret girl the now 35 year old woman was known and entered the stage as “Gaudi Claudi”. But nowadays she, who was born in Neu-Ulm and is a self-educator, has focused her attention towards painting. Here also Miss Hagmeyer prefers to have an artist’s name : “Angie Stern”. The artist paints in acryll, oil, oil wax chalk and pencil on paper, canvas and cardboard. A lot of her artwork emerges intuitive, she explains. “They are portrayals of my soul. Often expressionistic, surreal and abstract themes” reports Hagmeyer. Her paintings already were presented in “Kunstverein Schloss Almoshof” and in “Nachbarschaftshaus Gostenhof”. “It is my dream to be able to live from my art one day”. Two current projects support this hope. First of all Hagmeyer is represented in the online gallery “Freidenker”.At this online presence you can find among others famous names like “Helge Schneider” or “Josef Hader”. Furthermore an art calendar was published recently in the Calvendo Publishing Company called “Angie’s bunte Welt”. It contains ten paintings from Miss Hagmeyer. In these paintings there can be found a connection to the current season of the year. For example the month of April is represented by a painting called “The Flower Tree” that containts a tree with colorful flowers. “The desert princess”symbolizes the hot july. “The melancholic woman” is representative for the wet and cold november.